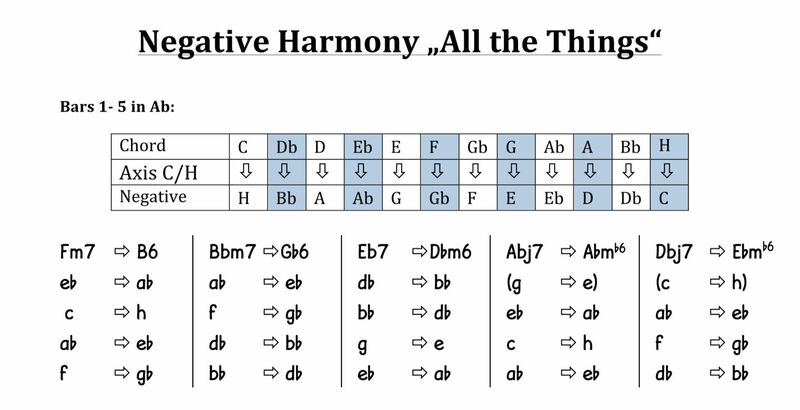 Negative Harmony is a harmonic tool. It was first described by Ernst Levy, who was a Swiss musicologist, composer, pianist and conductor (1895-1981). For the Jazz Musician, this tool is interesting, because it helps creating new sounds. What is negative harmony? How is it created? As you can see, in the key of C the f becomes d. This procedure you can use for putting the melody to its negative but also to create the negative chords for a progression. In the key of C, we create the negative of a C-Chord: c becomes g, e becomes eb and g becomes c. The C-Chord in C has a negative Cm-Chord. In the key of C, we create the negative of G: g becomes c, b becomes bb and d becomes f. The G-Chord has a negative Fm-Chord. The Progression G-C in the key of C becomes a negative Fm-Cm Progression. Have fun to check out new sounds!